Basil I, called the Macedonian (Greek: Βασίλειος ὁ Μακεδών, Basíleios ō Makedṓn; 811 – August 29, 886) was a Byzantine Emperor who reigned from 867 to 886. Born a simple peasant in the Byzantine theme of Macedonia, he rose in the Imperial court, and usurped the Imperial throne from Emperor Michael III (r. 842–867). Despite his humble origins, he showed great ability in running the affairs of state, leading to a revival of Imperial power and a renaissance of Byzantine art. He was perceived by the Byzantines as one of their greatest emperors, and the Macedonian dynasty, which he founded, ruled over what is regarded as the most glorious and prosperous era of the Byzantine Empire. It is remarkable that Basil I became an effective and respected monarch, ruling for 19 years, despite being a man with no formal education and little military or administrative experience. Moreover, he had been the boon companion of a debauched monarch and had achieved power through a series of calculated murders. That there was little political reaction to the murder of Michael III is probably due to his unpopularity with the bureaucrats of Constantinople because of his disinterest in the administrative duties of the Imperial office. Also, Michael's public displays of impiety had alienated the Byzantine populace in general. Once in power Basil soon showed that he intended to rule effectively and as early as his coronation he displayed an overt religiosity by formally dedicating his crown to Christ. He maintained a reputation for conventional piety and orthodoxy throughout his reign. Aspects of the family relationships of Basil I are uncertain and open to a variety of interpretations, the information given below should not be treated as comprehensive or definite. Constantine (circa 865 – September 3, 879), co-emperor to Basil from January 6, 868 to his death. 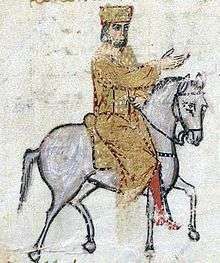 According to George Alexandrovič Ostrogorsky, Constantine was betrothed to Ermengard of Provence, daughter of Holy Roman Emperor Louis II and Engelberga in 869. The marital contract was broken in 871 when relations between Basil and Louis broke down. 1 2 3 4 Treadgold 1997, p. 455. 1 2 Vasiliev 1928–1935, p. 301. ↑ Treadgold 1997, p. 457; Vogt & Hausherr 1932, p. 44. ↑ Gregory 2010, p. 242. ↑ Finlay 1853, pp. 180–181. A man named John of Chaldia killed Michael III, cutting off both the Emperor's hands before returning to stab him in the heart. ↑ Treadgold 1997, pp. 453–455. ↑ Finlay 1853, pp. 214–215. ↑ Finlay 1853, pp. 221–226. ↑ Jenkins 1987, p. 191. ↑ Jenkins 1987, pp. 185–187. ↑ Jenkins 1987, pp. 196–197. ↑ Treadgold 1997, p. 461. ↑ Finlay 1853, p. 241. Chisholm, Hugh, ed. (1911). "Basil I.". Encyclopædia Britannica (11th ed.). Cambridge University Press.